Consisting of three men who have between them either written or produced some of the best worship songs of the past few years, it's no wonder that One Sonic Society are establishing such a strong reputation for themselves. Unbounded talent flows out of the group from every angle, with multi award winning producer Jason Ingram somehow managing to find the time to be lead vocalist despite being constantly in demand with every artist from Chris Tomlin to Sanctus Real wanting him to produce their albums. Read More Consisting of three men who have between them either written or produced some of the best worship songs of the past few years, it's no wonder that One Sonic Society are establishing such a strong reputation for themselves. Unbounded talent flows out of the group from every angle, with multi award winning producer Jason Ingram somehow managing to find the time to be lead vocalist despite being constantly in demand with every artist from Chris Tomlin to Sanctus Real wanting him to produce their albums. Then there's former Delirious member Stu G on guitars, a man who has played on more albums than I've had hot dinners. Last but by no means least is Paul Mabury who also manages to find time to play drums in between producing albums for the likes of Brandon Heath, All Sons & Daughters and The Desperation Band. 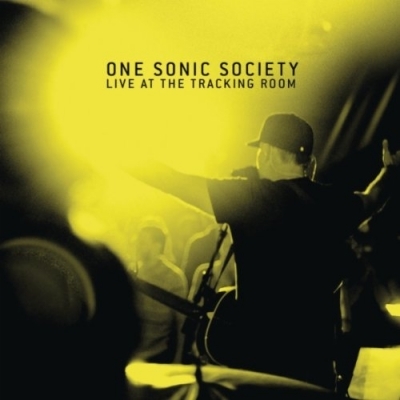 'Live At The Tracking Room' is described by Jason as "the album I've wanted to make for a long time. It's honest and hopefully to that end beautiful." Recorded in Nashville at a gathering of worship leaders, the album features some of the best songs from One Sonic Society's mini EPs and first full-length album 'Forever Reign', plus a handful of new songs. Opening gently and quietly, 'The Greatness Of Our God' gets things started with Jason leading and the audience providing an added depth subtly in the background. As an acoustic sounding guitar drives the song, the crowd become more audible, singing as a well rehearsed choir, "And I'm far from close to all You are, the Greatness of our God". Sounding instantly more upbeat, 'Lay Me Down' has a sublime chorus as the crowd sing "I belong to you alone, lay me down, lay me down". With a beat matched by the crowd clapping, and prominent electric guitar, this is an early highlight on the album. Returning to a more hushed style, new song 'Higher Than All' is musically beautiful as Stu's guitars are joined by some well used orchestral strings. "You are my God higher than all" sings the chorus simply but poignantly. Next up is 'Holy (Jesus You Are)', which Jason co-wrote with Matt Redman. This is another moving ballad to God, which Jason sings earnestly, crying out in praise. "God most high and God most worthy, You are Holy, Holy, Holy Jesus, You are." The simple but infectious guitar riff continues to loop throughout the song with a tone that just bleeds emotion. The quiet, reflective 'Jesus, Son of God' co-written with Chris Tomlin, recently appearing on the 'Passion: White Flag' album, and once again makes use of some lovely orchestral sounds. Another new song is 'Light Shine In' with its steady tempo and anthemic chorus "Make way make way for Christ has seen... let Your kingdom come... Come let the light shine in." Paul Mabury co-wrote this one with Jacob Sooter from Vertical Church, and it's sure to be a new favourite among worship leaders. 'Almighty God' has quickly become a classic in recent times, having been made popular by Rebecca St James, and here it gets a reworking, with a haunting opening which gradually leads to the more familiar chorus. "Almighty God is our fortress, He is with us". But it's the bridge later in the song that really grabs the attention, "We will not fear, though the mountains shake, He is strong to save". Another stunner. If the previous track was a classic then 'Forever Reign' is practically an institution. Many artists have already recorded this song, including the eminently influential Hillsong. Moody strings compete with the gentle guitars as the song opens quietly: "You are good, you are good when there's nothing good in me. You are love, you are love on display for all to see". Rising in tempo and volume, the triumphant chorus is both rousing and beautiful "Oh I'm running to your arms... nothing compares to Your embrace, Light of the world forever reign". Bringing the song right back to it's moody opening, an orchestral solo midway through is followed by a slowly building bridge to take the song on to its powerful chorus. Featuring some nifty guitar work, 'As For Me' is another track that begins quietly, gradually building throughout. It's the longest song on the album, giving it plenty of time to indulge its sense of arms-outstretched worship, making you just want to close your eyes and be surrounded by the music. Closing track 'God You Are My God' continues the atmosphere of worship with Stu's guitars setting a fabulous tone reminiscent of those wonderful solos he excelled at for Delirious in songs like 'My Soul Sings' and 'Take Off My Shoes'. Having been recorded with an audience of worship leaders who have clearly taken the time to learn the songs in advance of the recording means that this isn't your average 'live at a gig' kind of album. Instead what it does is show how these worship songs would work in a congregational setting, demonstrating that their use in church services was clearly the intention when they were recorded. As their website so aptly puts it, "This is OSS at their best, leading live worship with a community of musicians, worship leaders, and friends", and they do it with an abundance of class along the way.